If you also encounter the similar problem just like Jester, don't worry, an effective WMV cutter is of great help to trim WMV files for you. You can split WMV files online or with a third-party desktop program offline. Since there are a great many WMV trimmers in the market, it is time-consuming to pick out the best one. Thus, here we'll show you 2 easy methods to cut WMV video files efficiently with top-rated desktop or online WMV cutters. 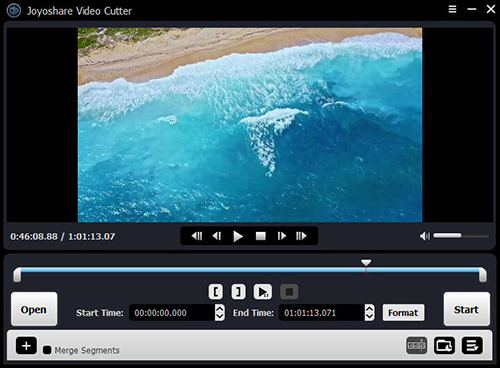 Among all the desktop WMV video cutting tools on the internet, Joyoshare Media Cutter could be the best and easiest video cutter to help you cut WMV files without re-encoding at a lightning fast speed. The program allows you to split the WMV video files into small pieces, remove the unwanted parts and join the important segments to form a new one losslessly. Alternatively, if you'd like to edit the video apart from cutting it, you can also realize it with many editing features such as rotate a video, add watermarks and subtitles, apply special effects, etc. After finishing cutting or editing WMV video with Joyoshare, you can also export and save the trimmed segments in many other media file formats and mobile devices. 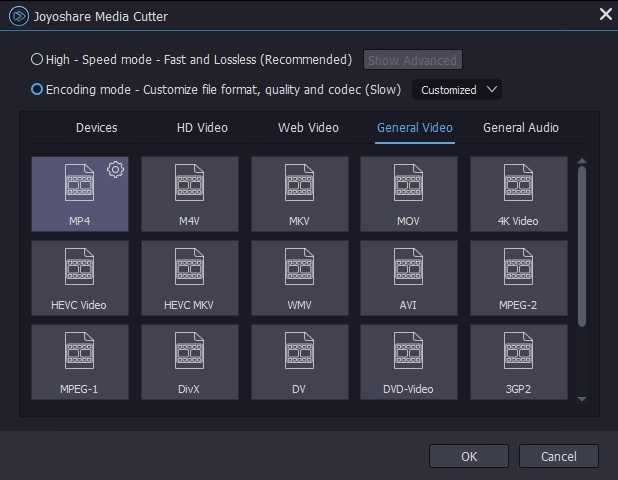 Now follow the guide below to see how to cut WMV video file effectively on Windows or Mac with Joyoshare Media Cutter. First, launch Joyoshare Media Cutter on your computer. Drag and drop the WMV video that you want to cut to Joyoshare or click the "Open" button to import the target WMV video. You can only add one WMV video each time. After the WMV video is imported, now you need to set the cutting portion by moving the sliders or enter the start time and end time manually. You can also add more new segments after clicking the "+" button, and merge the video clips together by ticking the "Merge Segment" box. Note: You're also allowed to edit all the video clips if necessary. 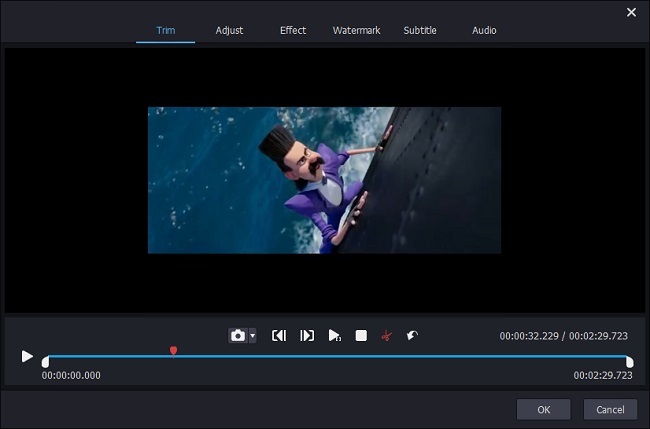 Click the edit icon beside the clips and then you can trim the video, rotate and crop a video, add special video effects, embed titles and watermarks, etc. Then click the "Format" button and choose the "High-speed mode" that will cut WMV video file losslessly and fast. If you've edited the WMV video in the previous step, you'd better select the "Encoding mode" to keep the settings. You can also customize formats, quality and codec, bit rate, etc. if you like while choosing this output mode. Now click the "Start" button to trim your WMV video. A while later, you can find your new video on the destination folder . 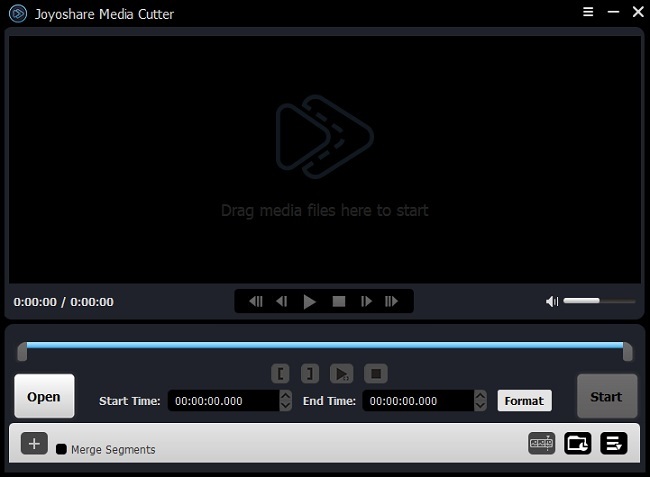 Another method to cut WMV file free is to trim it online by using best online video cutter. 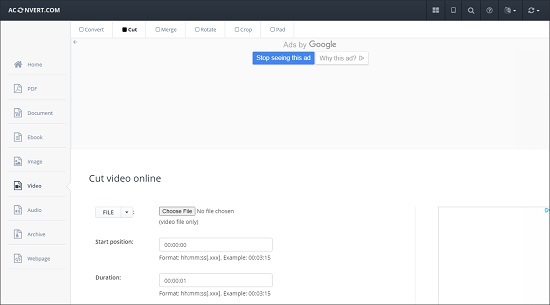 Among the free online video splitter tools, Aconvert.com is an easy to use yet powerful one, with simple cutting steps. Now let's come to the specific tutorial in detail. Go to its official site first, and then click the "File" button to browse the WMV file you want to cut. Or, click the "URL" button to paste a URL link of a WMV video. Remember your video file cannot exceed 200MB. Then set the video start position, and the duration you want to keep in the format of hh:mm:ss. For example, 00:01:16. After your settings are done, now click the "Submit" button to start processing the WMV video. It will cut the video parts you selected without reencoding. Wait a few minutes until it's completed, you can download the file by pressing the download icon or save it to Google Drive or Dropbox.